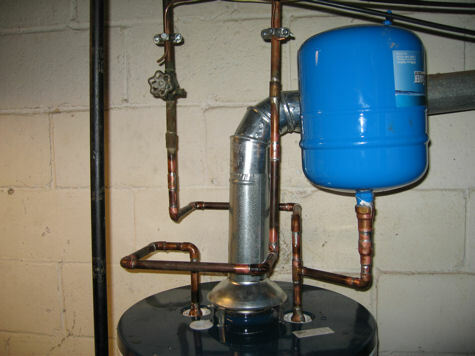 Water heater plumbing is the most important part of installing a new hot water heater. Before you attempt to do any work on your water heater�s plumbing, it is important that you know exactly what your local building code requires. Failure to comply with your local building code can put you and your family in danger. Not complying with code will jeopardize your home�s eventual sale if an inspector finds non-compliance to code. If you do not know your local building code, call a licensed plumber in your area to ensure that all work is completed to code. There are a number of factors that may require you to change some of your plumbing when you install a new hot water heater. If you have an extremely old water heater that was installed a long time ago, updated codes may require that you completely replace the plumbing to and from your hot water heater. Another factor can be changing the size of your hot water heater. Because a unit with a larger capacity will take up more space, you may need to place your new hot water heater in a different location than the old model. This will certainly require that either new pipe is run or that old pipes are re-routed. Water heater plumbing may need to be changed is if you are switching from gas, electric or natural gas to a different kind of power source. The most drastic change would come when changing from gas to either electric or natural gas. You will likely be moving the new water heater to a different location, possibly even another room in the house. It is also very important that the gas tank is drained and prepared properly before any attempt is made to remove it from your home. If you have any questions or concerns, call a professional to do the job right.